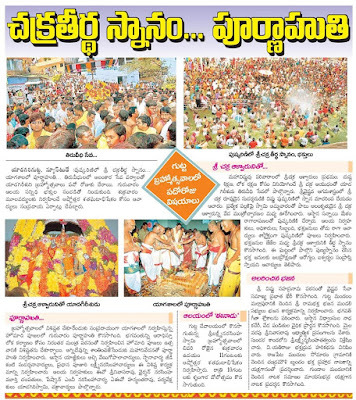 Yadagirigutta Brahmotsavam 2010 was completed yesterday with the final event of Srungara Dolothsavam, hundreds of the devotees attended the program, and SLNSD devstanam arranged the all the necessities. One more new Ghat Road will be arranged for Yadagirigutta Uphill Temple, as the State Govt decided with the Rs.12.50 Crores. 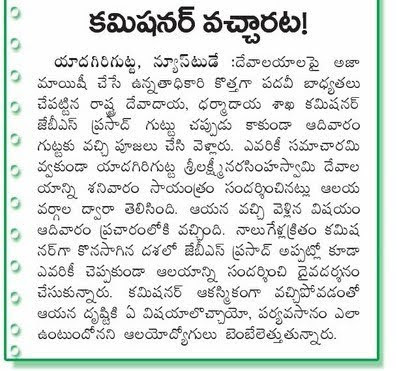 Said A Muralidhar Rao, SE R & B Div. at Miryalguda. Designing works of Ghat Road are under progress and will be finalized shortly, added Rao. 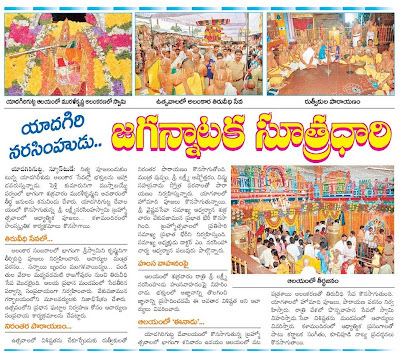 Chakrathirtham celebrated yesterday grandly at Yadagirigutta as a part of Brahmotsavam. 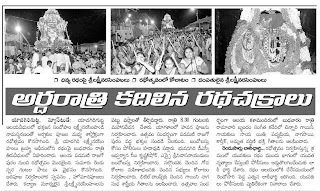 thousands of devotees attended this program held at Vishnu Pushkarini on Up hill. 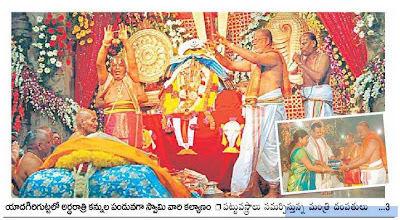 Rathotsavam of the Brahmotsvam at yadagirigutta celebrated grandly yesterday night, huge crowd attended the program from various localities of the state. Yadagirigutta Sri Laxmi Narasimha Swamy Kalyana Mahotsavam celbrated grandly yesterday midnight (23.02.2010) at Yadagirigutta Uphill. thousands of devotees attended the program. and also Ministers of the state. Devastanam arraned free buses from Down hill bus station to Uphill. 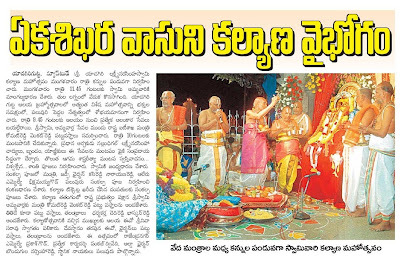 today night Edurkolu Mahotsavam celebrated at yadagirigutta in a part of Brahmotsavam. tomorrow will be the main event Kalyana mahotsavam will be celebrated. 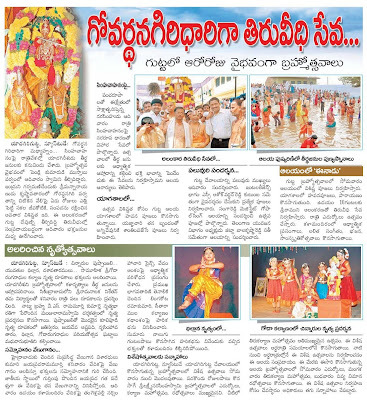 Part of the Brahmotsavam, Culturl and musical programs also began at uphill Sangeeth Bhavan. 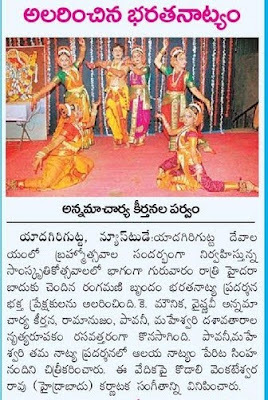 today night (18.02.2010) Rangamani troup performed bharathantyam which was enjoyed by the audience and devotees. Mounika, Vaishnavani Annamachayray keerthana, Ramanujam, Pavani, Maheshwari's Dashavathrara Dance balle and also Kodali Venkateshwar Rao karnataka music programs also audience enjoyed. 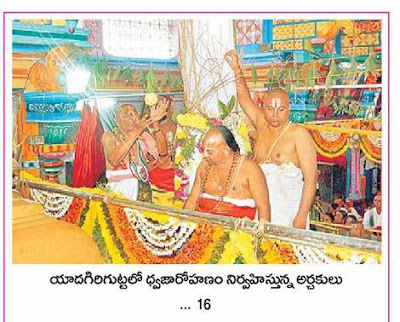 Swamy gave darshan in a Jaganmohini avatar. 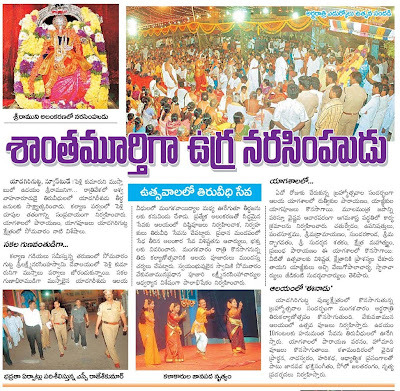 Dwajarohanam program was held in yadagirigutta as a part of the brahmotsavam on 17.02.2010. ECIL, Hyderabad to Rangapur road was widened upto Thurakapally which will be very convenient to Hyderabad city surrounding people of Kusaiguda, Kukatpally, Balanagar, ECIL etc., other than NH 202 city people can utilize this route. from thurkappally, yadagirigutta is below 20 KM only. Candian women visited Yadagirigutta temple in traditional Indian sarees. 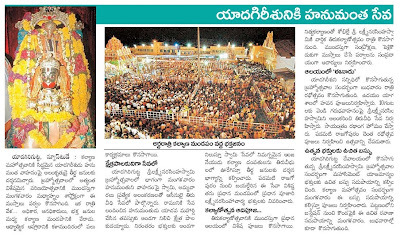 Ekashikaravasa's Brahotsvam arrangements are completed as they made coloring of temple and Gopuram at Down town etc., other arrangements also done people waiting for the starting of brahmotsavam 2010. Akhanda Jyothy yatra reached Yadagirigutta on Monday evening (15.02.2010) which was started from Hyderabad before four days. 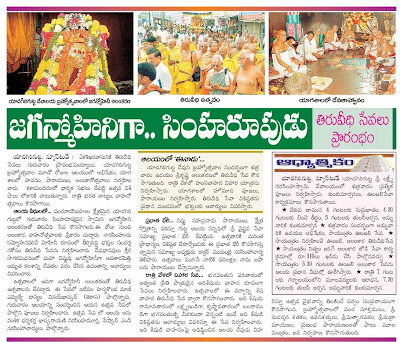 this is become a tradition now since 15 years some of Hyderabadi devotees arranging this program every year before starting of Brahmotsava this jyothy is reaching Yadagirigutta. Cine Actors Jayaprakash Reddy & JV Ramana Murthy visited Yadagirigutta on 14.02.2010. 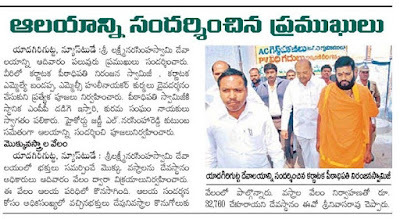 Secret visit to Yadagirigutta by Commissioner JBS Prasad ?! if it is correct and if he will take some serious action i will be very happy, at least some problems will solve for the benefit of tourists. 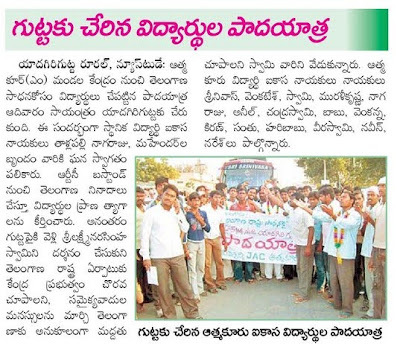 Student padayatra (Journey by walking) was reached Yadagirigutta yesterday 14.02.2010 which was started from Mandal town of Aathmakoor (M) in part of their Telangana Agitation. Local student leaders welcome them at Yadagirigutta, then they did the prayers to lord Narasimha swamy for Telangana State. Karnataka Peetam's Sri Niranjan Swamiji and Karnataka MLA Bandappa, MLC hulinayakar Kurma visited Yadagirigutta Temple 0n 07.02.2010. 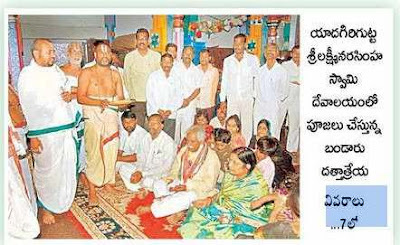 BJP Party State President, Bandaru Dattathreya visited yadagirigutta SLND Temple on 07.02.2010. during the press meet said the present telangana agitation will not be stop untill the formation of the Telangana State. 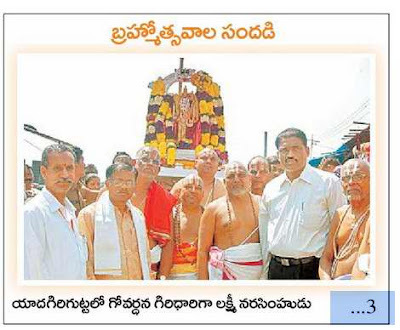 This is great news for the yadagirigutta citizens and also the devotees of Lord Laxmi Narasimha Swamy. 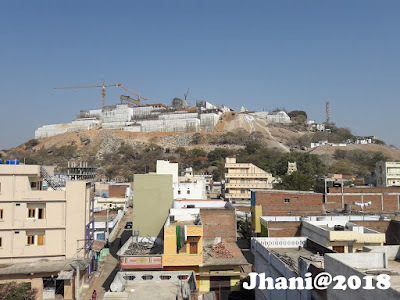 Tourism Department is planning to arrange the Helicopter Services to yadagirigtutta from Hyderabad for coming Brahmotsawam which is going to start from 16th of February 2010. 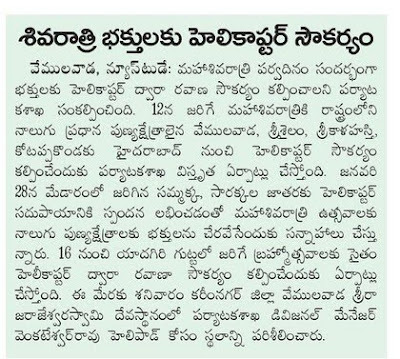 Based on the success of Samakka Saralamma temple helicopter services, tourism department planning for all other temples as they are going to start the services on this shivaratri to Vemulavada, Srisailam, Srikalahasthi and Kotappakonda. 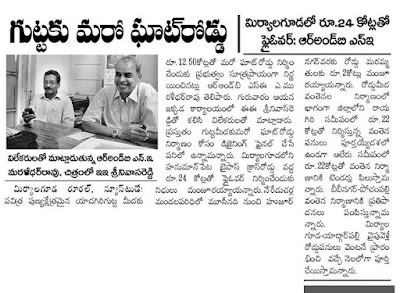 Said Divisional Manager Tourism Venkateswar Rao. Chamundeshwari Sadanam has been constructed by Kuruma Community of Yadagirigutta, to provide accommodation for the kuruma community devotees of Lord Narasimha Swamy. 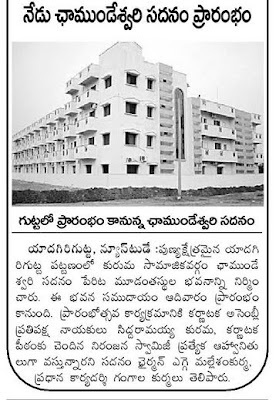 This 3 floor building is going to inaugurate today (07.02.2010). Karnataka Opposition leader Siddaramaiah, Karnataka Petam Niranjan Swamiji will be attended for this event as special guests.